Well, Valentine’s Day is officially over and you know what that means, right? Time to move on to the next holiday. Now, I’m aware that next Monday is Washington’s Birthday and President’s Day, but really… What kind of subway art could I do with that, right? I’m sure I could come up with something, but most people know it as a day off of school (and work, if you’re federally employed) and a reason for car dealerships to have a “sale” and air obnoxious commercials. Besides, I was feeling LUCKY when I made this up. Lame? Yes, I know. I made it 5×7″, but my computer has done some wacky things with the last few pieces I saved… if it’s actually larger, well, guess you’re LUCKY too. If it’s smaller, let me know and I’ll see what I can to do fix it. All the testing I’ve done on it seems to make it 5×7″ or larger though. This piece is 100% free. Visit 4shared and download them. Again, we have black font on a white background so you can print on whatever you want. There is piece that has the shamrock in green instead of black. Enjoy! And I’d love to see what you do with it. If you do take it, please become a follower, if you aren’t already… =] Thanks! 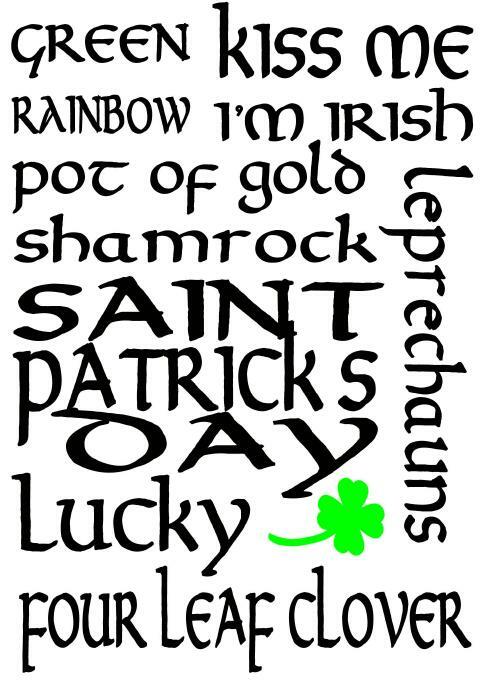 For more free Saint Patty’s Printables, check out these links too. Speaking of, you may remember the Valentine Subway Art I made up… Carrie at Dittle Dattle made a cool pillow out of it (by the way, if you haven’t checked that out, you really should! )… well, Vicki at Green Eyed Girl Crafts made this cute, sparkly edition with it. I love me some sparkles! Awesome job, Vicki! I am featuring this on my blog tomorrow! I’ll be the first to admit that I love this piece even more because it’s NOT GREEN! I’ve never been on to decorate for all the little holidays but something simple and neutral like this makes me SWOON! Great job! My son was born on St. Patrick’s Day so I always enjoy decorating for that holiday. This is a really cute idea, thanks for sharing! Great subway art! Love it! I love the subway art craze right now. This one is great and the Valentine one is super cute! Thanks for sharing!! Found you on Sundae Scoop! love ur blog!! sooo cute!! i’m ur newest follower!! Love it. Thank you. I am also loving your blog. Now following and off to look around. Very cute! Thanks for linking up to Beyond The Picket Fence. Love this! Thanks for sharing! 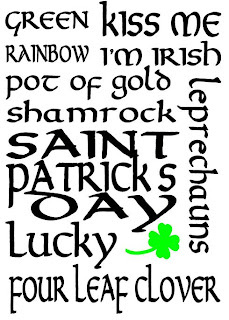 I am like you I am already thinking green, spring, st.patty’s day! and this is my first with subway art! I love it! I’m loving all the subway art! Now I just need one for every holiday to swap out. LOL Can we call me a lazy crafter? wow. st patty’s day already??? this year is flying by! Love it! You were featured today on my blog – Today’s Top 20! Love if you could stop by! I am your newest follower from the Welcome Wednesday blog hop. Have a great day! Really cute, Valentine’s Day subway art! Where do I find this on your blog? Is okay if I save it to use for personal stuff?